Chef Dan Bobo is a classically trained chef and a graduate of the Culinary Institute of America in Hyde Park, New York. 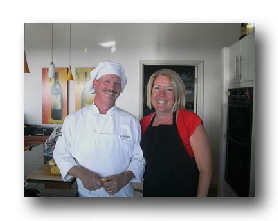 He has over 30 years cooking experience and has held Executive Chef positions at restaurants in the Seattle area. He and his wife, Clare, moved to the Big Island in 2002 where they both went to work at the Kohala Coast resorts before starting Island Thyme Gourmet. He is well versed in global cuisines with extensive expertise in seafood and, of course, local Hawaiian flavors. During his career, Dan has been a guest Chef on the Graham Kerr Show, Cooking with Todd in Seattle, and the Electric Kitchen here in Hawaii. He is also featured in the 33 Chefs and 34 Chefs cookbooks. Clare has many years of front of the house service and management experience in upscale restaurants and hotels. She has strong knowledge of wine and can assist in wine pairings for your special dinner. She is currently a Chapter Leader for Slow Food Hawaii and an active volunteer at Mala’ai, the student garden at Waimea Middle School. She knows the Big Island well and will happily share her knowledge of local attractions, culture, restaurants, beaches and farmer’s markets with you. As members of Slow Food, Clare and Dan are committed to using Hawaii’s local produce, meat, eggs and fish whenever possible and supporting our local farmers. By doing so, we can provide you a meal that truly showcases the Big Island’s local products in unique, delicious and healthy ways. If you are committed to good, clean, fair food-please check out SlowfoodUSA.org to find your local Slow Food Chapter.